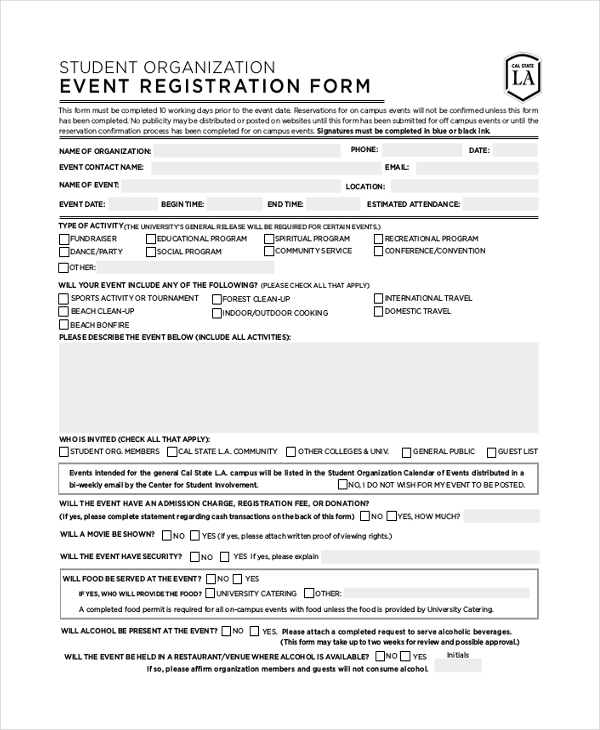 The registration forms are indispensable when you are planning some conference or event or a program that would mean a good lot of participation or attendance. Thus, you have a camp registration form, voters registration form, conference registration form and so on. These forms are designed to collect information about the participants and officially sign them up as the guest or participant in the program. 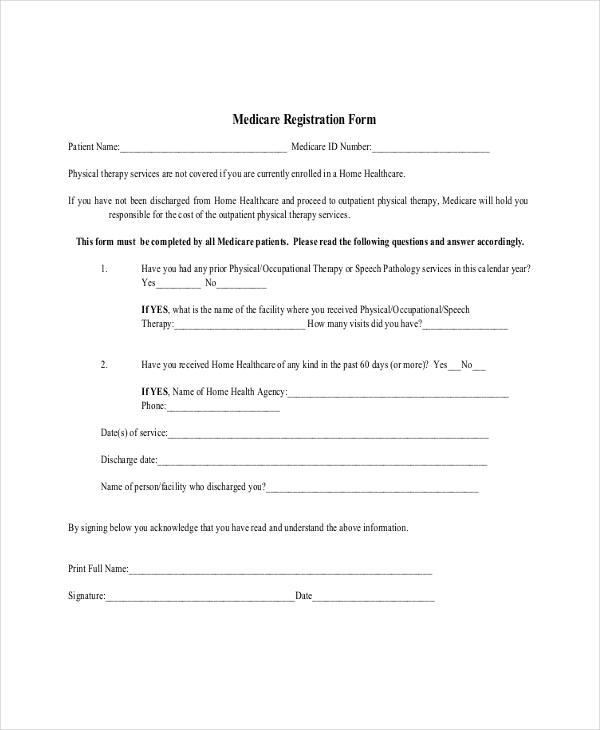 In case, you need ideas on framing a standard registration form, there are registration form templates to help you out. You are getting a detailed conference registration form template here with all the needed sections required in a standard registration form. These include sections on contact information, employment or job details, dietary requirements, special requirements for the conference and so on. 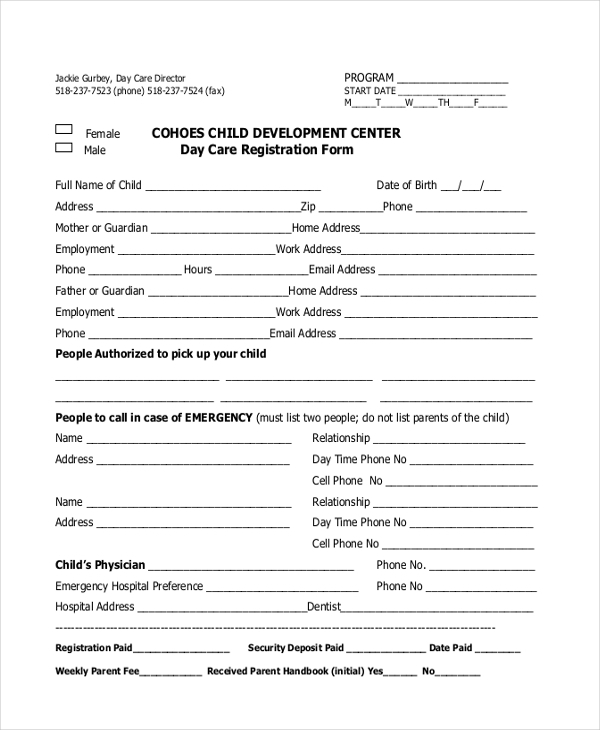 If you run a daycare organization and looking for ideas on creating a registration form, this registration form template here shows you what sections to include in such a form. These include basic identity details of the child along with that of parents, people assigned to pick up the child, person to contact in an emergency etc. 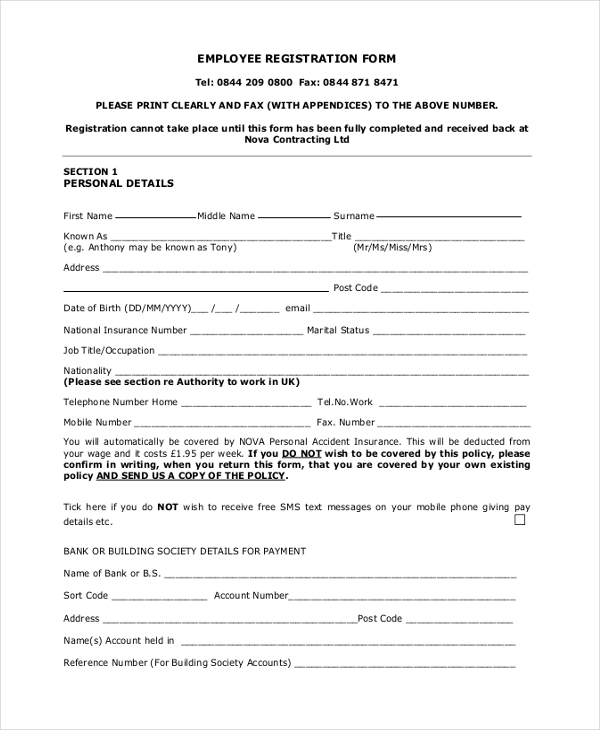 This employee registration form comes with a comprehensive approach for gathering all the basic essential data about an employee and you have sections on- the employee’s personal details, details for payment, agency details and also a list of documents needed for verifying the registration. 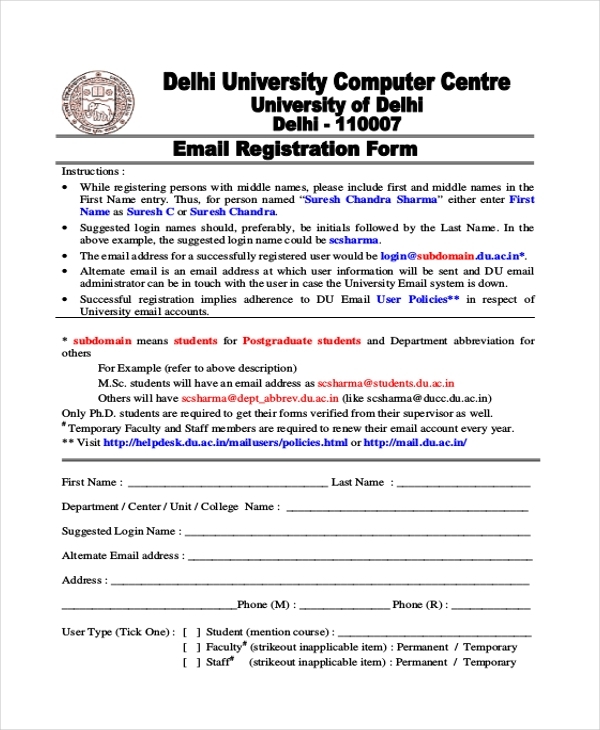 This is a very useful email registration form which is needed when somebody is filling an email registration as a part of some educational institution. Before the actual registration process starts, the form offers a complete set of instructions on how to fill up such a form. This event registration form is to be filled by any unit or community planning to hold an event on a certain campus. The form enables one to provide a description of the event as well as cite certain specifics like the presence of alcohol, availability of food etc. 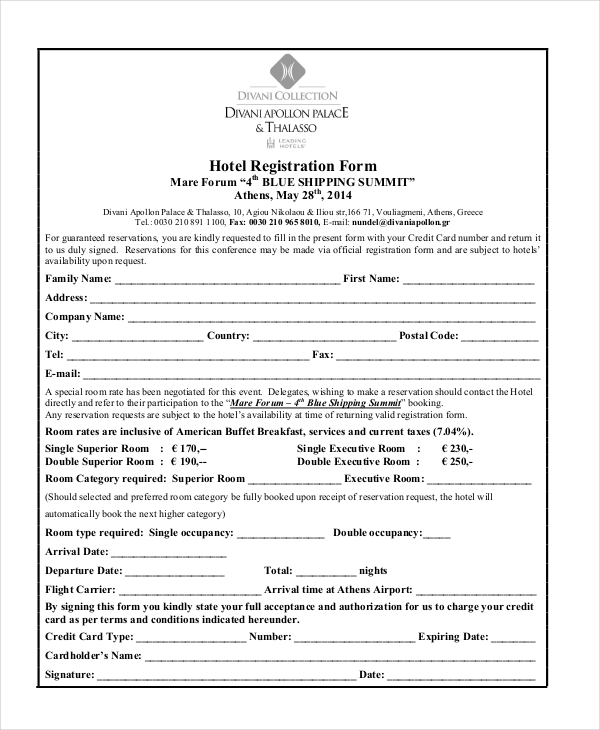 You have an elaborate hotel registration form here which is meant for the guests planning a stay in a hotel. Along with basic identity details, the form comes with sections where the guest can mention about his room preference, credit card etc. 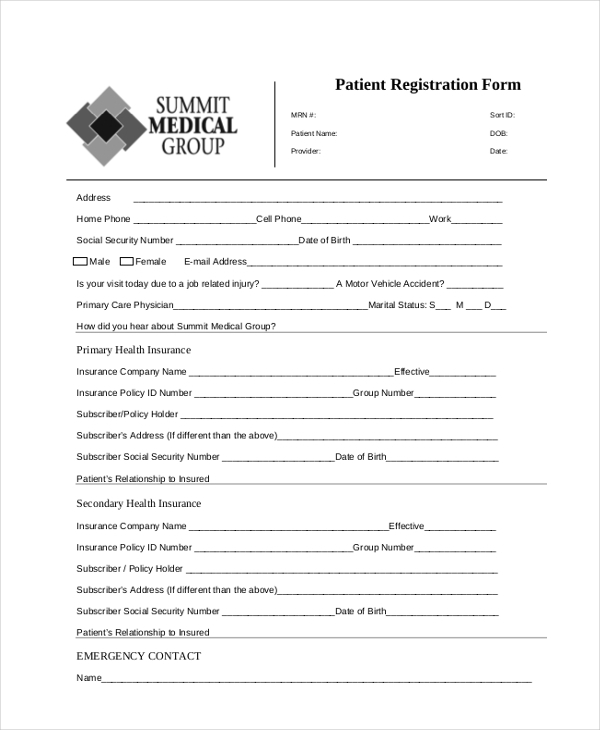 If you need an idea on how to frame a medicare registration form, this registration form template would be the thing to go for here. The form comes with spaces to gather information on the patient as well as his history of the medical condition. This patient registration form is to be used when a person is about to take admission in a medical center. The form will enable the patient to mention about his or her reason for visiting the clinic, the insurance details, emergency contact and so on. 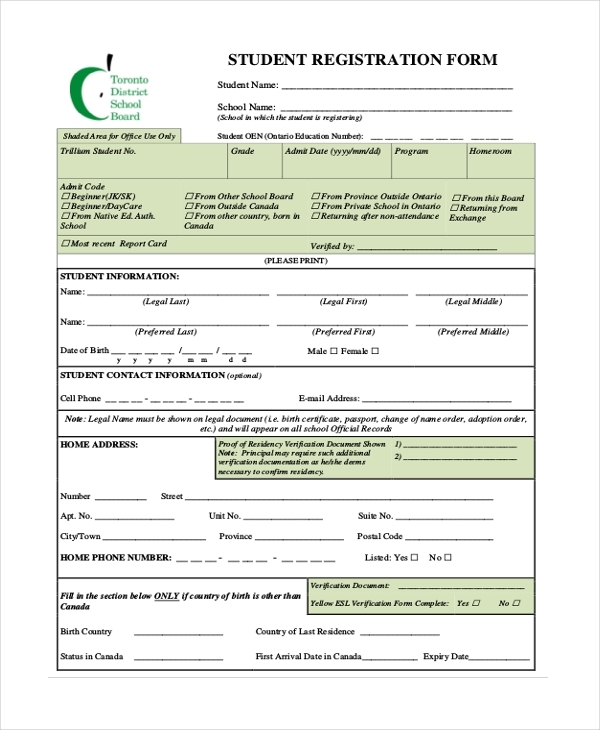 This registration form template offers you a fair idea on how a student registration form would look like when somebody is taking admission in a school. The form includes sections on the student’s basic identity, contact details, educational background etc. 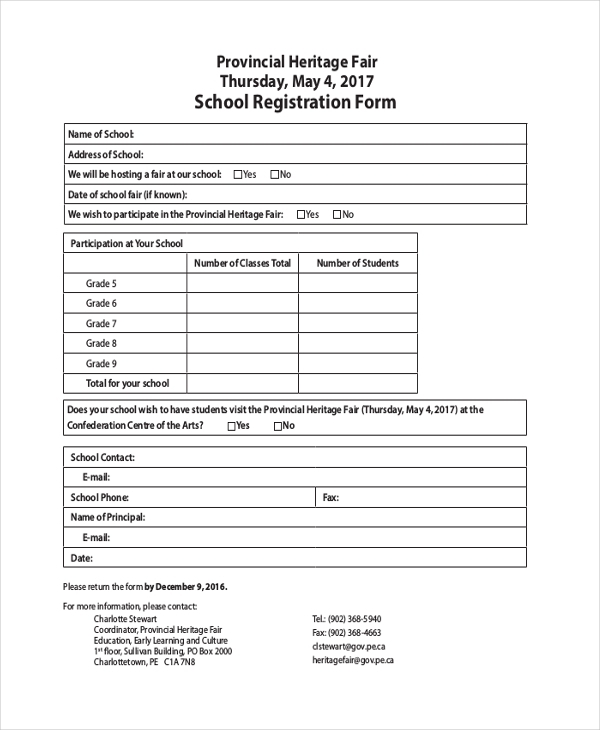 This registration form is to be filled by the school authority when the institution is about to take part in an event. The registration form enables the school to mention about the number of grades to be participating in the fair. 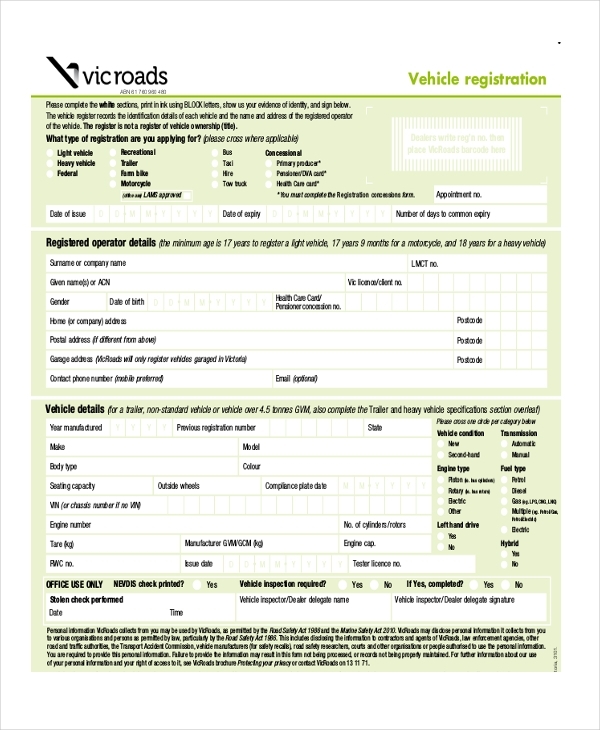 This is an elaborate vehicle registration form template that will allow the vehicle owners to submit information of the vehicle to register the vehicle. The form contains sections on types of registration, details of the registered operator, payments and so on. 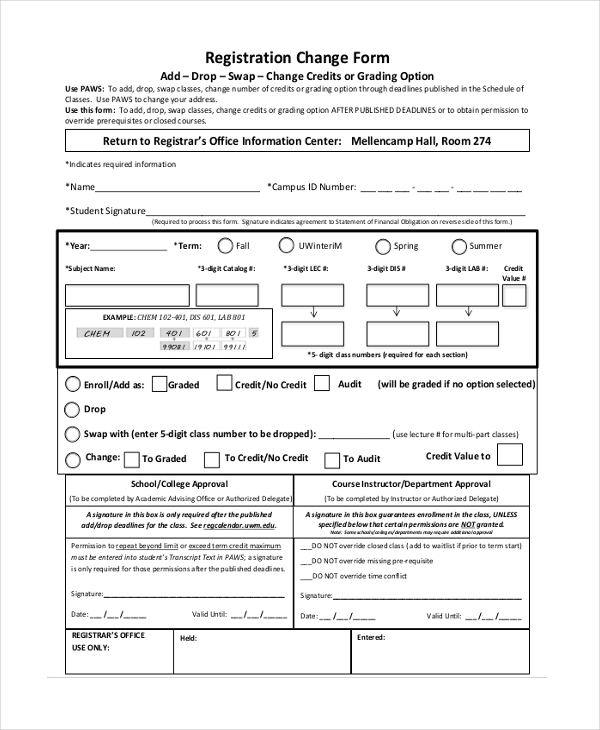 This registration form template would be useful for those who wants to change a number of credits or grading options after the deadline is over and to gain access to the closed courses. This form contains needed pointers that will help the student to mention the swapped preferences. 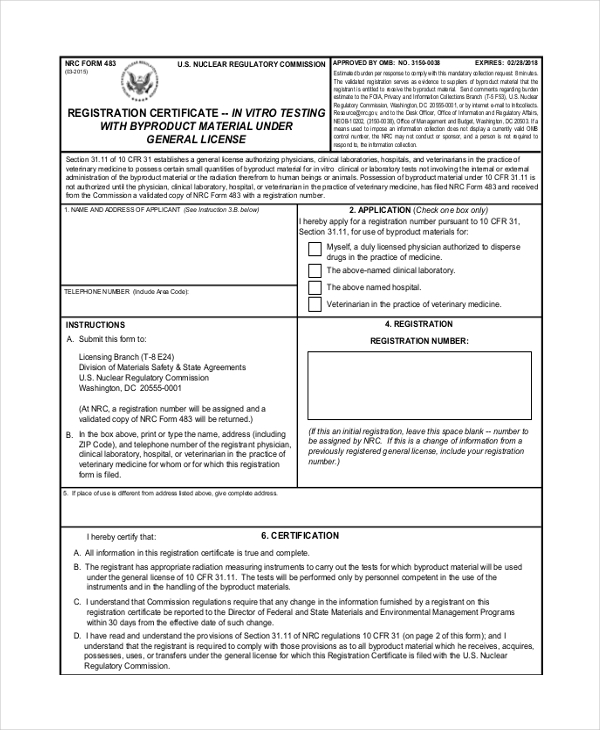 This registration certificate form is for physicians or vets looking to conduct lab test with byproduct material under a general license. The form contains separate tables on instruction on filling or submitting the form, registration, certification and so on. Conditions and limitations of the general license are also mentioned. 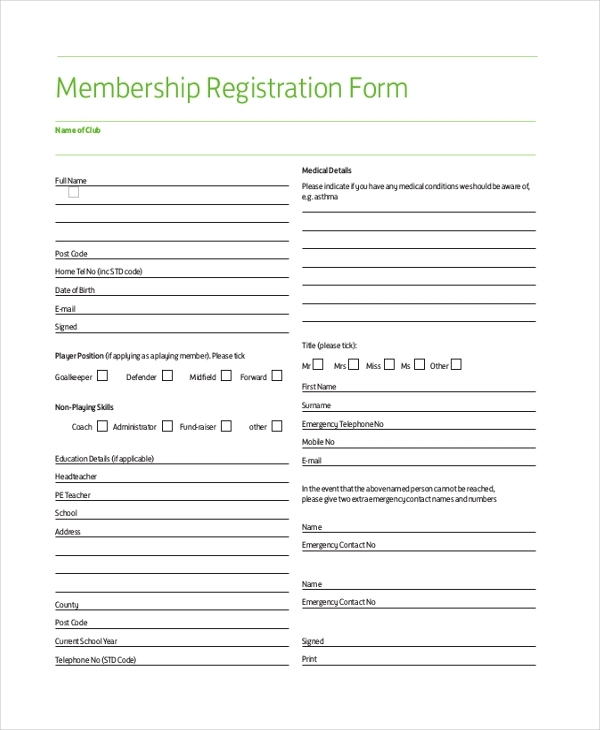 You are getting a standard framework for a club membership registration form here. It starts with basic identity and contact details of the member, followed by sections on his education, player skills, medical details, data on the person to be contacted during an emergency and so on. 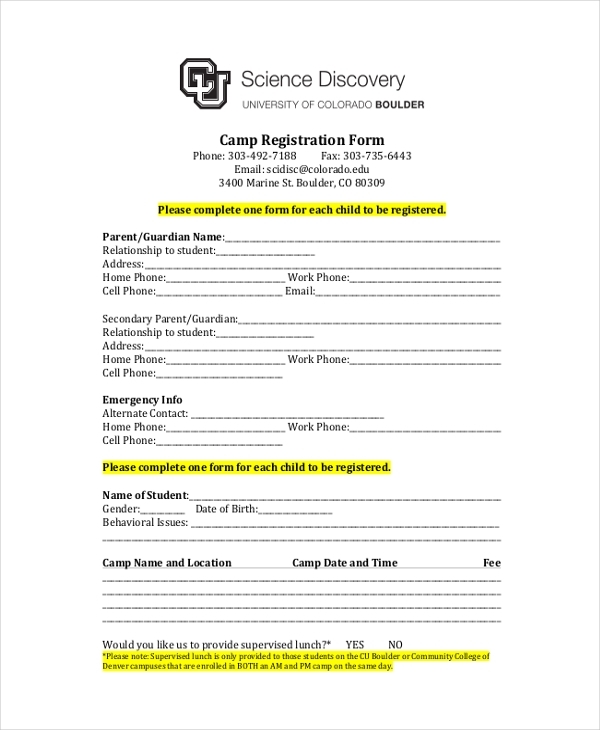 This registration form template would be useful for every camp organizer when he wants to gather information on the participants of the camp. The form comes with pointers on parent/guardian of the child, emergency information, identity details of the student and information of the camp. 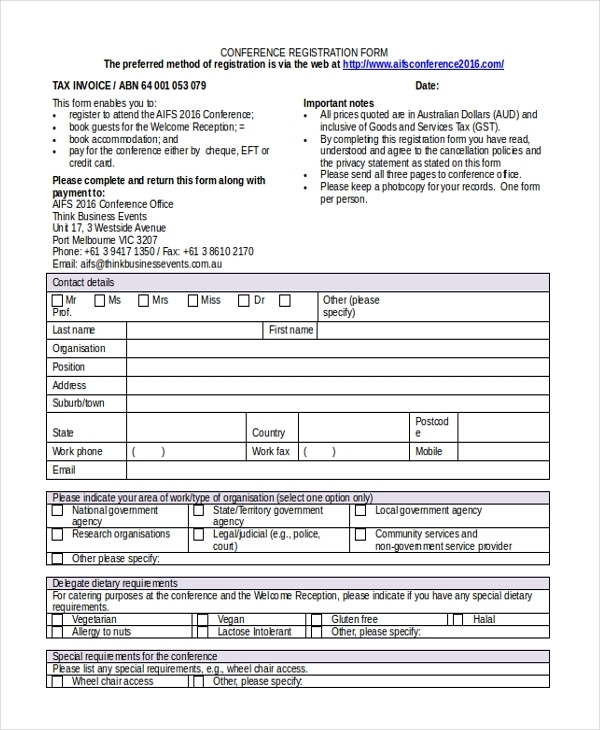 If an NGO is about to participate in an event, then it has to submit its details through a registration form and this registration form template shows how such a form would look like. This form includes sections on the organizational information of the NGO, details on Board trustees, legal compliance, beneficiary group etc. 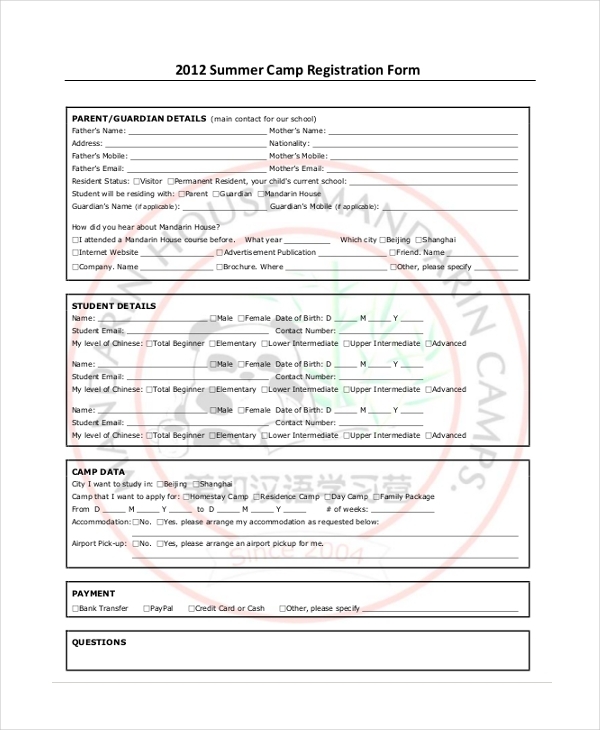 You are getting a comprehensive and professionally designed summer camp registration form template here. It starts with information about the parents of the children to be participating followed by a complete section on the participant student. There is a separate section on payment data. 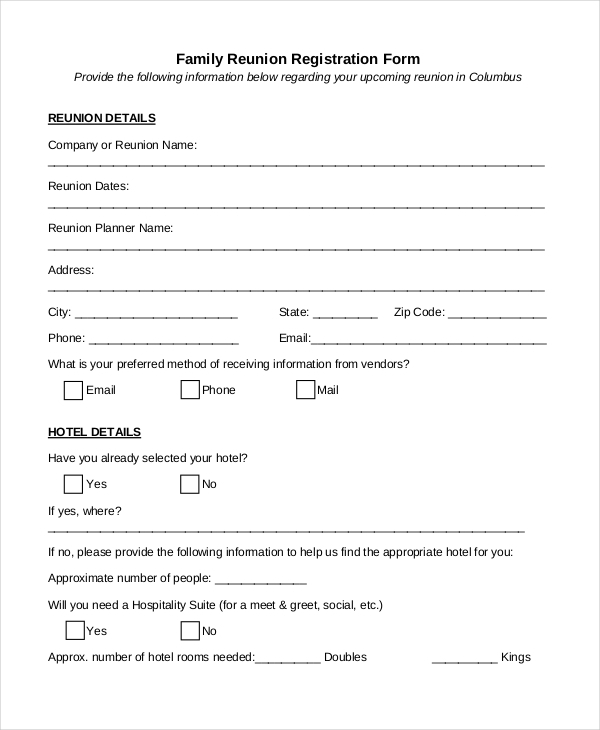 This family reunion registration form would be useful for organizations managing family reunions as this form would enable them to gather complete data on the parties planning a reunion. The form comes with all needed sections like reunion details, hotel details, history of reunion, banquet details and so on. 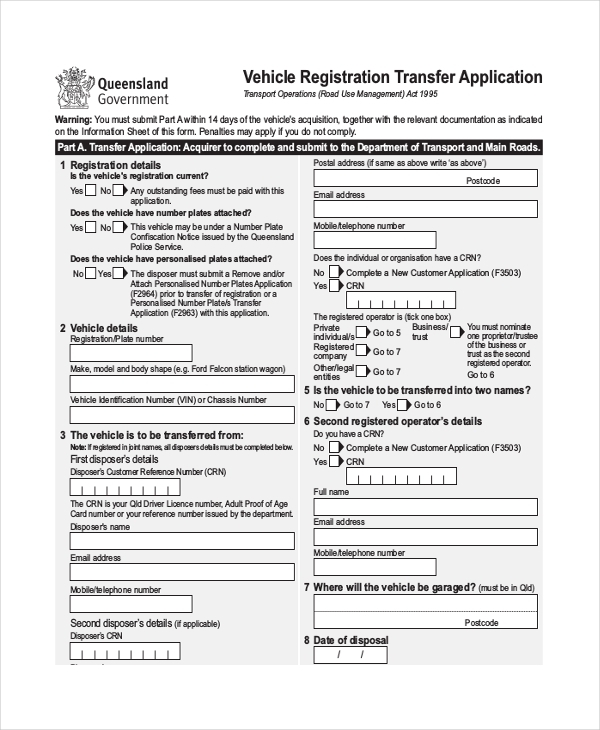 This is a vehicle registration transfer form which is to be filled by the vehicle owner planning to transfer his vehicle registration after acquiring the vehicle. The form includes details on what the acquirer must submit about vehicle acquisition and also contains pointers to be maintained by the disposer. 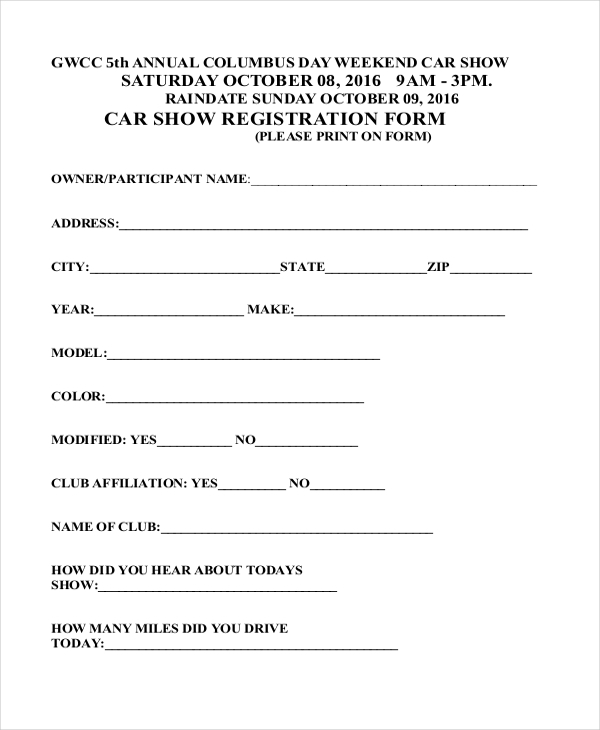 Who Needs a Registration Form? A registration form is needed by anybody looking to conduct a conference or seminar where he has to gather information about the attendees. Besides, organizations conducting different activities such as camping would also need a registration form template. Then, if a certain premise has agreed to offer space for a community to hold an event, the authority of that campus must have a full document of the event and the event organizer through a registration form. Educational institutions like schools or colleges and clinics too would require the registration forms when somebody is willing to take admission in their setup. What is The Purpose of Registration Form? The main purpose of registration forms is to collect and gather data about the attendees of a certain program or an event by the program organizer. It will help the organizer to have an idea on the basic identity details of the participants as well as whether they have any special preferences or needs in regards to participating or attending the event. Moreover, registration forms are a way to legally establish the attendance or participation of individuals in the program or conference. These forms also allow you to have information on the people to contact in case the attendee faces an emergency situation while attending the event. The templates mentioned above show you how various registration forms look like. Whether you are looking to design registration forms for school registration or vehicle registration or student registration or conference registration- you have expertly designed registration form template samples for all. They are pre-designed and would relieve you from starting the whole form from the start.